The perfect handshake, not to tight, not too lose, but just right. 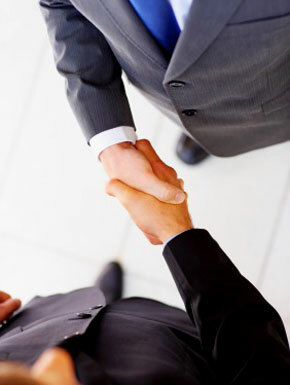 The handshake has been a traditional greeting, a symbol of peace and a key part of business deals for thousands of years. New research reveals that as many as two in three people (70 per cent) have a crisis of confidence when it comes to performing the act of a human handshake. The importance of the handshake applies equally to men and women – I became used to shaking hands when we lived in Scotland for a year. In that culture it is the general polite greeting for both men and women, and it became a habit I adopted and maintained when I returned home. We (that includes us, girls) don’t have to kiss everyone we meet. Now someone has quantified it. Professor Geoffrey Beattie, head of psychological sciences at University of Manchester, devised an equation taking into account 12 key measures. 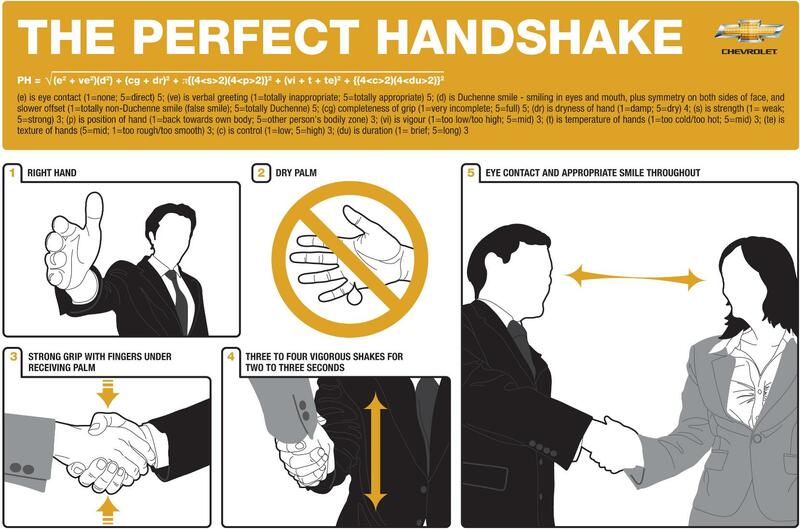 The mathematical formula has been developed for car brand Chevrolet as part of a handshake training guide. Professor Beattie said: “The human handshake is one of the most crucial elements of impression formation and is used as a source of information for making a judgment about another person.” A limp handshake speaks of insecurity and the Latham-style looks like it was attempting to intimidate. The elements of the formula are listed below** but for the regular guy and gal like you and me, what does the professor suggest? Now that doesn’t seem to difficult? **(e) is eye contact (1=none; 5=direct) 5; (ve) is verbal greeting (1=totally inappropriate; 5=totally appropriate) 5; (d) is Duchenne smile – smiling in eyes and mouth, plus symmetry on both sides of face, and slower offset (1=totally non-Duchenne smile (false smile); 5=totally Duchenne) 5; (cg) completeness of grip (1=very incomplete; 5=full) 5; (dr) is dryness of hand (1=damp; 5=dry) 4; (s) is strength (1= weak; 5=strong) 3; (p) is position of hand (1=back towards own body; 5=other person’s bodily zone) 3; (vi) is vigour (1=too low/too high; 5=mid) 3; (t) is temperature of hands (1=too cold/too hot; 5=mid) 3; (te) is texture of hands (5=mid; 1=too rough/too smooth) 3; (c) is control (1=low; 5=high) 3; (du) is duration (1= brief; 5=long) 3.